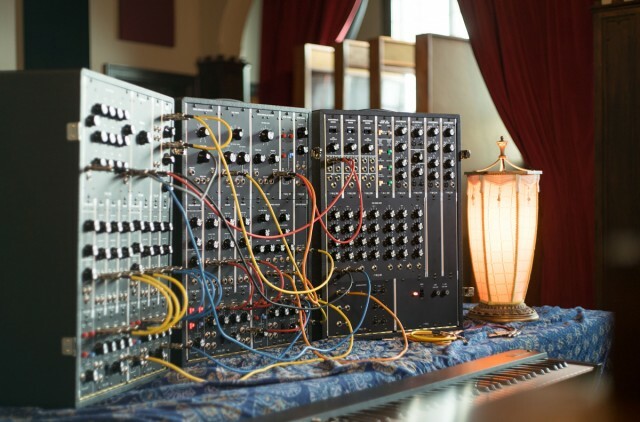 Moog Music have announced they’re painstakingly recreating a 1969 modular classic. So we asked the engineers why they’d do that – and why it costs 35 grand. It’s clear now that Moog has two lines of products. The Moog Music products most people buy really are distinct from this. When founder Bob Moog relaunched his company (first as Big Briar, later as Moog Music), he focused on things like Theremins and the relaunched Minimoog Voyager, followed by the immense hit of new Moogerfooger pedals. And as far as the new synths and effects went, what you got were really modern takes on the originals – descended from the classic models, down to the signature ladder filter and so on, but updated with modern parts and new design features. Those pedals also ensured that Moog wasn’t just a brand for keyboardists and synth nuts, but, guitarists and instrumentalists too. Moog have never tried to be a low-cost brand. But you can’t exactly call them elitist either. From putting products like the Minifoogers in reach to semi-modulars well under $1000 to some terrific iOS apps that sell for just a few bucks, Moog sell alongside a lot of other stuff. But, if that’s Moog’s day job, they have this … side hobby. And that’s been recreations – not just of the original Minimoog, but of much more complex modular instruments. What appeared to be a one-off novelty (a recreation of Keith Emerson’s modular rig) turned out to be an ongoing fascination of the company’s engineering team. And they’re not easy or inexpensive to make. This week, the North Carolina-based company announced a new edition of the IIIp – an all-in-one, benchmark edition of the original modular line. It’s the instrument Wendy Carlos (Switched on Bach), George Harrison (Abbey Road), and Isao Tomita (Snowflakes Are Dancing) all used. It’s definitely a luxury item. Forty will be made, at a cost of US$35,000 each, shipping around May. If this were just a pricey absurdity, though, I wouldn’t be writing about it. There’s no doubt this is a classic – what Moog prove again is that a historical instrument can go right back into production. Nor is $35k expensive when thinking of musical instruments in the acoustic domain; as Moog championed in the 60s, it seems the Moog company want you to think of synthesizers in the same category as a fine violin or piano. But all that being said – this still surely leaves us with some questions. (“Are you nuts?” springs to mind.) So I asked the Moog Music company to explain themselves. Here are their answers from the team that worked on the recreation. For some context, I’ve actually asked Moog this once before – the first time round. But it’s nice to update these answers for the new hardware and its specific component and build requirements. The IIIp is the portable cabinet version of the IIIc, so this was a logical follow-on. The overall sonics of these systems is unmatched. The entire system is discrete, with no modern ICs anywhere to be found, so the depth and dimension that comes from them can be overwhelmingly physical. Offering modules alone is tricky for us. 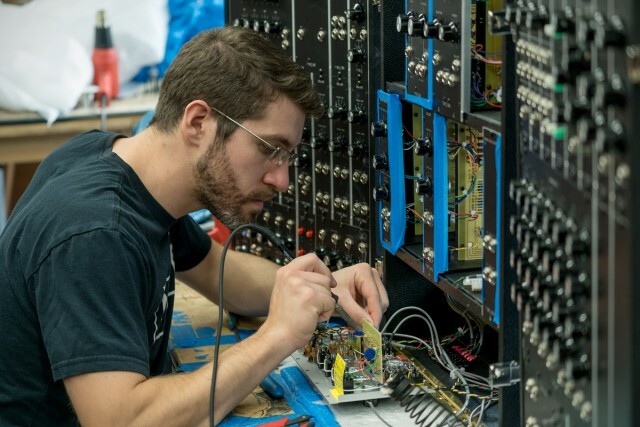 Moog is still a small, employee-owned company — we hand build every modular system that leaves our factory. The demands of re-creating these systems is quite large due to parts, resources and cultural limitations (these days it’s rare to have complex machines built by hand in the United States). Were any parts difficult to source? (rare, or costly?) Did any substitutions have to be made because of availability? Building the Synthesizer IIIp to original spec requires an immense attention to detail and seriously tests our commitment to hand-crafting our legacy modular synthesizers, which presents new challenges every day. Key components for these projects that were common place 50 years ago are now obsolete and no longer available through traditional distribution channels, so we have to source our NOS supply through a divergent network of surplus vendors. Sometimes, a part has become obsolete and no surplus is available, such as with the inductors used in the 914 Filter Bank. Modern equivalents just won’t do in terms of retaining the sonic character of the original, so we worked closely with one of our parts suppliers to re-issue the custom inductors exclusively for our legacy modular projects. Even S-trig cabling is getting harder and harder to source reliably. 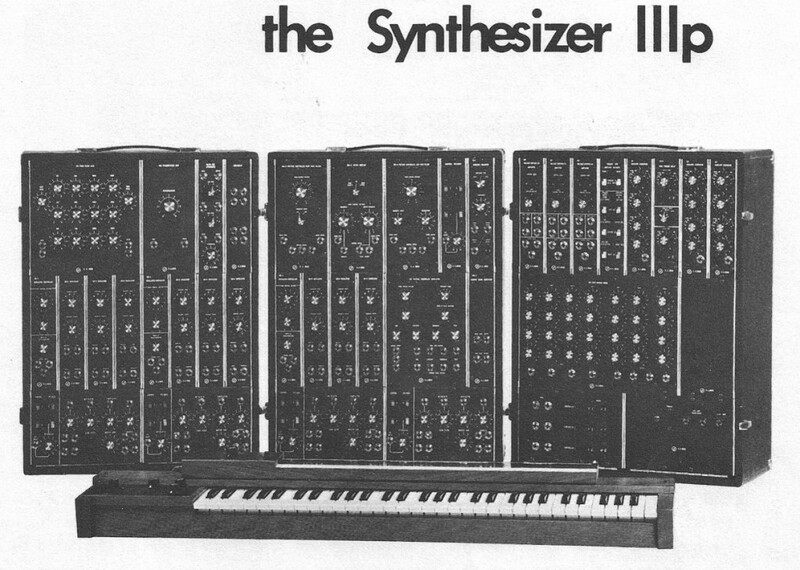 Buying a IIIp new between 1969 and 1973 equates to more than $50,000 USD in today’s money (based on 1969 R.A. Moog Price List price of $7,985), so $35,000 represents a significant decrease in price for these systems. The cost of handcrafting these instruments in the exact same way today as we did in the past has increased at a staggering rate — and even though it may be hard to believe, we have worked diligently to keep the cost to the consumer as low as we have. Obviously we are aware that only a few can afford these systems, but the more instruments we get into the world, the more opportunities people have to experience them. Cost of course is something people will notice. Is this the design of the thing versus what we make now, the low quantity, a combination? Anything that is 100% handcrafted by human beings in low quantities costs a lot more to make. The process to build a single IIIp takes hundreds of hours of labor to complete. Every circuit board is hand populated and every component has to be hand soldered by someone in the Moog Factory. Each circuit board has to be mounted into a module, and then that module has to be tested and calibrated — multiply that by 37+ (depending on how you count modules) and you start to get an idea of the scope of this build. Next, each cabinet has to be hand wired and dressed (including hand crimping the connectors). And after that, all of the modules are placed into the system and the entire system is burned in and tested. Every single module gets recalibrated so that the system is calibrated to itself, which is what ultimately forms a cohesive instrument. What’s the market for something like this? Composers, sound designers and students of the sonic arts (Universities) are drawn to instruments like the Synthesizer IIIp. Artists who seek to pin-point human emotions and set them to resonate through the power-of-sound tell us that nothing moves through speakers and directly into your body like these systems do. How does continue making remakes fit into the larger Moog strategy? To be honest, I suspect a lot of us figured we’d see a couple and then it’d stop, not that it would continue! Moog is made up of a group of widely diverse individuals who all share a passion for creating inspirational tools. This isn’t just our passion alone, but a legacy of creative energies going back 7 decades. As Moog employees, we are immensely inspired by the process of bringing our early synthesizers back to life. The potential of these systems is still unfolding — there are still sounds that will emanate from them that haven’t been heard before! Thanks as always to the folks at Moog for being open to talking about this. And — yeah, I want to hear one of these in person, especially having learned modular synthesis in school on vintage Moog and Buchla modulars and being endlessly inspired by Wendy Carlos’ compositions and orhchestrations. Though — well, I may still try to get my sounds into your body from my gear! We’ll have more on Moog soon – including that nice new DFAM that we can actually afford! -Ed.